Star Wars Rebels Season Two is making good on its promise to explore the backstories of the main characters. Last week was Hera, and this week Sabine took center stage giving us a glimpse into her bounty hunter past in the form of her old friend Ketsu Onyo. The episode was also unique in that it focused almost entirely on one of our heroes, with a couple of main characters being completely absent from the story. "Blood Sisters" is considerably lighter in tone than the previews for the episode would have had you believe. This was due in large part to Chopper tagging along on this mission. The main struggle this episode had was balancing the tone of Chopper's antics with the tense reunion between Sabine and Ketsu. While the comedy in the episode generally worked, at times it undercut Sabine and Ketsu's interaction and I worry that it may have overshadowed what was a really interesting story. An interesting aspect of this week’s instalment was that, for the first time on Rebels, we had main characters sit out the entire episode. By giving Kanan and Zeb the week off, and limiting Hera and Ezra's roles, "Blood Sisters" was able to focus solely on one character, Sabine. Even in past episodes where one character took the lead (last week's "Wings of the Master" springs to mind with Hera) the other main characters still played a role in the story. 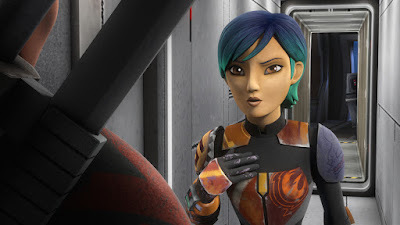 By isolating Sabine, the show avoided distractions, and allowed us to focus entirely on Sabine confronting her past. Ketsu Onyo is a nice addition to the Rebels roster of characters. In some ways she reminds me of Zare Leonis from Season One, in that I expect we'll see her again eventually, but first she's going off to have some adventures on her own. Also, like Zare, Ketsu’s friendly to the Rebels cause at the end of the episode but not completely ready to sign up for the Rebellion just yet. Much like Hondo did for Ezra a few weeks ago, Ketsu represents the path not taken for Sabine. It is through these interactions we see the impact of Hera, Kanan, and the rest of the Rebels on Sabine and just how committed to the cause she really is. Rebels barely scratched the surface of Sabine's past in Season One, but we can see she has already come a long way from where she was then, when she was having difficulty trusting Hera. This episode expanded on the trust issues Sabine was having in Season One--being left for dead by your only friend will do that to a person! That being said, there is still plenty more of Sabine's story left to be told-- for example, exactly what happened on Mandalore that made Sabine and Ketsu break out of the Academy? But what we got this week adds some interesting layers to Sabine's character and gives us some more insight into who she truly is. Ketsu and Sabine's first meeting was a fun homage to the gunslingers of old Westerns, right down to the music and the shots of Sabine's hand hovering over her holster while they circled each other. Star Wars has often been called a Western in space, with bounty hunters in particular representing the gunslingers, so to have such a direct nod made for a cool sequence. Ultimately, my issue with this week’s episode is the same problem that has plagued the season so far: the lack of an overarching story. Season One had several story lines--the crew of The Ghost's exposure to the larger Rebellion being the main one, and the mystery surrounding Ezra's parents being another. Season Two just doesn't have a clear through line yet; all of the episodes have been stand-alone and don't seem to be building to anything in particular. Yes, we had the scene at the end of this week’s episode where Sabine delivers EG-86 to R2-D2 but without knowing the significance of what EG was carrying, this scene lacks the weight it needs. Bail Organa showing up at the end of the second episode of Season One was a big deal because it was promise of things to come. But now that our heroes are actively working for the larger Rebellion, delivering intel to Alliance higher ups, while still cool, feels somewhat routine. Don't get me wrong, I'm happy to be exploring the pasts of our heroes but I'd like to see a little more direction as to where the story is going. Part of the greatness of the Season One finale "Fire Across the Galaxy" was that it felt like a culmination of something we had been building to all season. Hopefully, as the current season progresses it will become clear as to how all of what we've seen so far is building to something else, but right now I'm just not seeing it. Overall, "Blood Sisters" is another solid instalment of Star Wars Rebels. The character of Ketsu is a strong addition to the cast, and someone I look forward to seeing more of down the line. The introduction of a character from Sabine's past not only gives us a glimpse into what happened to her before the series, but also helps to show how committed she is to the Rebellion. Where the episode stumbles is in its over-reliance on humor from Chopper and the season's lack of an overarching plot. Fortunately, neither of those issues overshadowed the character moments for Sabine in the episode. This was a throw away episode and disappointing given, as you say, what was hinted at in the trailer. I wish this had been a two parter to flesh out the back story between Sabine and Onyo but it seems that there is almost a reluctance on the part of the story team to want to go deeper with any of the characters. I am, becoming increasingly frustrated with the lack of an over arching plot this season and it's actually getting to the point where I don't look forward to the next episodes with the same enthusiasm as I did with season one. This was not a good episode at all.